Cost to install a gas line varies greatly by region (and even by zip code). Get free estimates from natural gas installers in your city. Cost to install a gas line varies greatly by region (and even by zip code). Get free estimates from natural gas installers in your city. How much does it cost to install a gas line? If you are adding a new gas appliance, such as a gas water heater, dryer, or stove, you’ll likely need to install a new gas line. You can also extend an existing gas line, such as when adding a gas appliance outside. Some local gas companies offer this service for free, but in most cases you’ll need to hire a professional or do it yourself. The average cost of installing a 50-60 foot gas line is $200-$250, although the size of the gas line depends on how many appliances are attached to it. In most cases, you will want to install a completely new gas line; however, if you are adding a smaller appliance or already have a gas line that is rarely used, it is possible to extend an existing gas line for around 75% of the cost. Talk to a professional before attempting this project yourself, as extending the line is more complicated than simply installing a new one because of the differences in new and old pipes and connections. Extending an existing line is also not always safe or efficient, only a professional can judge if the existing line has the capacity to add another appliance. In general, most pipes are installed the same no matter the type of gas that is used. Although it is possible to install a gas line yourself, it is recommended to always hire a professional unless you are an exceptionally skilled DIY-er. There is risk of working with flammable gas when installing a gas line, and professionals are experienced enough to eliminate most of it and hopefully avoid a gas explosion. There are also certain types of products or pipes that are only available to professionals because of their volatile nature. Most gas lines can be installed by plumbers who charge an average of $45-$65 per hour. Installing a gas line typically takes 2-4 hours, for a total labor cost of $90-$260. A PVC conduit is essentially a long sleeve for the gas line pipe, which acts as extra protection against damage and gas leaks. 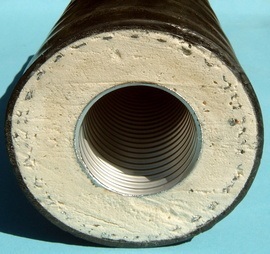 Conduits are often used in gas lines under high-traffic areas, like under the main section of the house, or in regions that are prone to earthquakes, natural disasters, or shifting earth. The average cost of a PVC conduit is $1-$3 per linear foot. A steel casing pipe 1 is an additional pipe that fits around the gas line to protect it from leaks and damage. Casing pipe 1 is connected to the gas line more than a PVC conduit because the two pipes are typically welded together. Steel casing averages $3-$5 per linear foot, depending on the quality of the steel and the diameter of the casing. A permit is typically required for installing a new gas line. Check with your contractor or local government office to find information specific to your area. Depending on how deep you dig for the new gas line, you may also need to call the 811 “Call Before You Dig” number to get clearance that there isn’t anything dangerous in the ground around where you plan to dig. Again, check with your contractor for specific details in your area. To prevent gas leaks, it is recommended to have a professional check your gas line once a year. This inspection typically costs $50-$75 and includes checking that the gas line is properly connected and working properly, which can help identify issues before they turn into larger problems. How much does it cost to install a gas line in my city? Cost to install a gas line varies greatly by region (and even by zip code). To get free estimates from local contractors, please indicate yours.